Former Thai Prime Minister Thaksin Shinawatra called on the government to pull back troops and restart negotiations. Thaksin: "The government should be mindful that these protesters are Thai citizens"
Bangkok, Thailand (CNN) -- Former Prime Minister Thaksin Shinawatra said Wednesday he was not the leader of the United Front for Democracy, the formal name of the Red Shirt opposition, and that their movement calling for new elections is not on his behalf. "They did not demand anything for me or on my behalf. I am not UDD leader," he said. " Any negotiation to end the demonstration or conflict must be made between the government and UDD leaders. I have no authority to negotiate on behalf of the UDD." The anti-government protesters support Thaksin, who was ousted in a 2006 bloodless military coup and who fled the country to avoid a corruption trial. 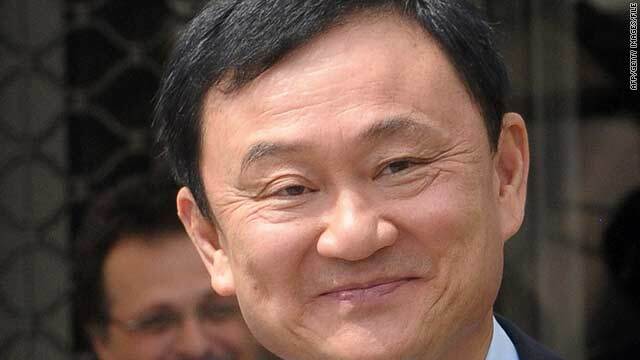 In a statement, Thaksin accused the Thai government of defaming him when it said he was the mastermind behind the violence in the country's ongoing political crisis. I believe in peaceful and non-violent means to end conflict and reject any use of force. "I never approve nor agree to any use of violence," he said. "I believe in peace. I love my country as much as any member of this government. I believe in peaceful and non-violent means to end conflict and reject any use of force. If there is any act of terrorism, it is the duty of this government to find the wrongdoer and prosecute them in the court of law." He urged the government to not resort to violence to disperse the protesters. "The government should be mindful that these protesters are Thai citizens. Please do not harm them. Please order the cease fire and begin the negotiation with the UDD leaders so there will be no more loss of life," he said.